Hiab, part of Cargotec, helps companies achieve maximum performance out of every pickup and delivery with its MULTILIFT hooklifts. In May 2014, the second MULTILIFT XR26Z was delivered to Haulaway in Australia. 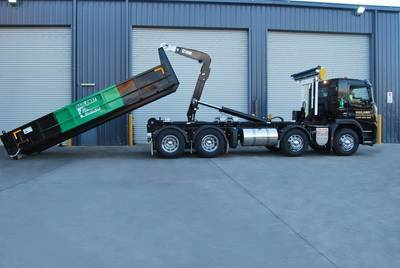 The Victorian waste and recycle expert was so impressed by the speed and efficiency of the first hooklift that it decided to add a second unit to its fleet. According to Richard Hilbert, Director of Haulaway, speed of operation and quality service are the key performance indicators when measuring success in Australia's waste industry. "This year marks our 30th year in operation, yet we are still a growing company that currently services up to 1,500 clients Australia-wide - and that number is increasing all the time." "Our drivers can visit up to 12 clients per day, sometimes even more, which is why it's important our guys work quickly and efficiently. To achieve that, we need reliable equipment that is easy to handle and able to take a hit every now and then." Hiab's MULTILIFT XR26Z hooklift was capable of fulfilling all of Haulaway's requirements, so Haulaway decided to upgrade in late 2013 - and it did not take long for their productivity to improve by 100 percent. "The new MULTILIFT unit can carry up to 21 tonnes per run, so we are getting about two extra loads per day compared to our old equipment," Hilbert says. "Because it has a flexible pivoting neck, it's now easier for our drivers to get the unit into tight areas such as shopping centre loading docks, where it can operate at a low height and still load and unload any size bins from 6m³-35m³. It also works twice as fast than our older equipment." In May 2014, the second MULTILIFT XR26Z followed - this time on the back of a new Volvo truck. "We were so impressed with the first unit that we decided to make it part of our future growth strategy. Once we told Hiab what we wanted, they turned around and delivered it within a fortnight. That's quality service," Hilbert concludes.